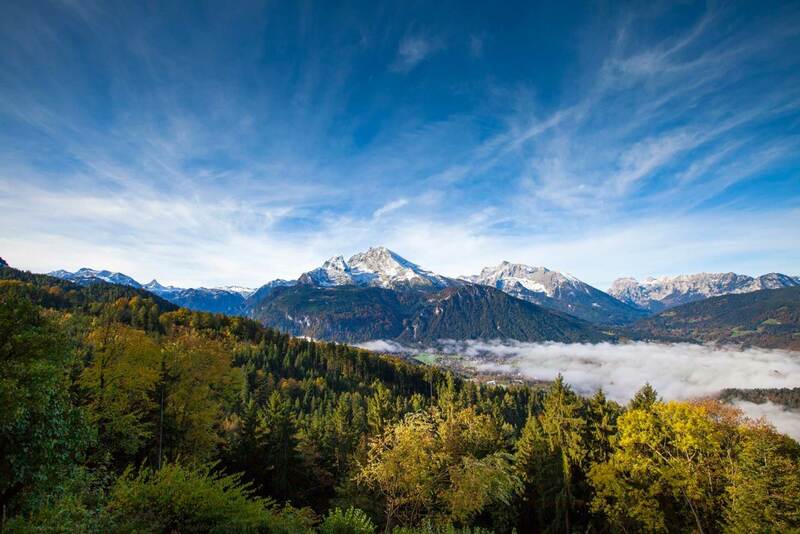 The guesthouse Graflhöhe offers an awesome view over the Bavarian Alps. 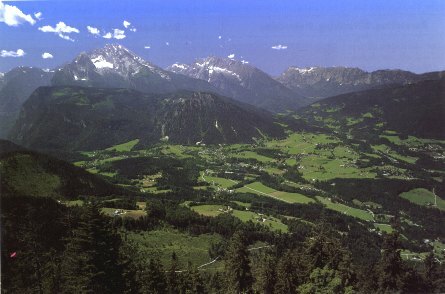 Watzmann (2714m), Hochkalter (2607m) and Reiteralpe (2286m) rise from the valley of Schönau and Ramsau. In front of the famous Watzmann you see the Grünstein (1304m) and left of it the plateau of the mountain pasture Kühroint. Far behind on the left you see parts of the Steinernes Meer. The Obersalzberg hosts a fully developed system of hiking trails. Most of the trails are situated on the western, sunny side of the Kehlstein and offer a beautiful view. One possibility to reach the Obersalzberg is with the Obersalzberg Cable Car, which has 2-person cabins. The Valley Station is located at the Schießstättbrücke in Berchtesgaden. We recommend combining the approach with a walk on the Carl-von-Linde footpath. This trail leads below the Scharitzkehl road by the guesthouse Hochlenzer and the guesthouse Graflhöhe right along to the mid-station of the Jenner Cable Car. You start at the ice stadium in Berchesgaden. You follow the footpath and reach the Scharitzkehl road after 3,5 km of different inclinations in 1050m altitude. Now you follow the Scharitzkehl road for 2km in direction Scharitzkehl/Hinterbrand. Slightly downhill you then arrive at our guesthouse kind of rested. Here we recommend a non-alcoholic Erdinger Wheat Beer – isotonic and reduced calories or one of our Grannini Juices to satisfy your thirst. The way back leads you downhill by the guesthouse Hochlenzer to the mid-station of the Obersalzbergbahn and from there on down the Waltenberg road in direction Berchtesgaden. 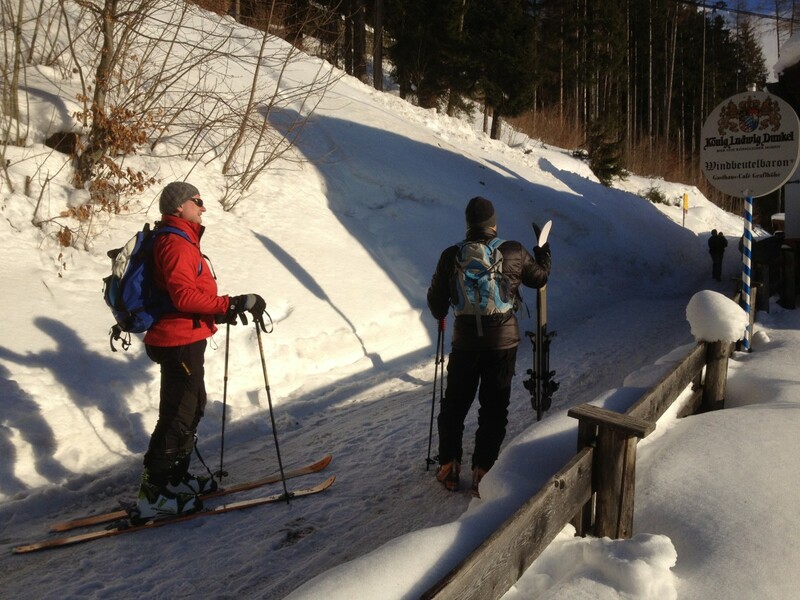 The Carl-von-Linde trail also is an ideal route for Nordic Walking. You can take the bus to the Documentation Center or park your car at the car park there. A little below starts the Carl-von-Linde footpath in an altitude of 950m and ends at the mid-station of the Jenner cable car in 1200m altitude after a distance of 7km in total. The guesthouse Windbeutelbaron is reached after 3km in an altitude of 1000m. After a break in our guesthouse you can either return to the starting point or go on towards the Jenner or walk by the Scharitzkehlalm up to the Ligeretalm, from where you have a wonderful view (the mountain pasture is without service). Here the Carl-von-Linde trail crosses and you can follow it back to the Documentation Center. Sledging only 20 minutes foot march from the Windbeutelbaron. A beautiful situated natural sledging trail leads you downhill to Berchtesgaden over a total distance of 3,5 km. Who prefers cross-country skiing finds the next cross-country ski run at Scharitzkehl, beneath the mountain Hoher Göll, only 1km from the guesthouse Graflhöhe – Windbeutelbaron. At the Gutshof/Obersalzberg skiers and snowboarders can enjoy the family-friendly ski slopes. To reach us by ski touring you start at the Vorderbrand road in Berchtesgaden and pass Stockklausner – Stocker – Sappen – Grafllehen. 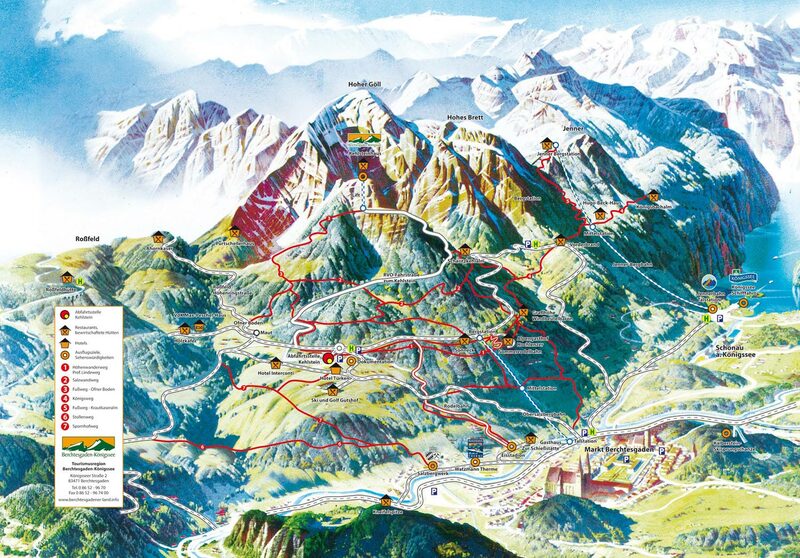 For more information ask at the Obersalzberg Cable Car!